Car driver critically injured, SUV passenger sustains serious injuries, charges to be filed after investigation finished. A man was critically injured after crashing a stolen car into an SUV in the Rock Creek area Saturday morning. Two occupants in the SUV were also taken to a hospital, one with serious injuries. Randall Todd Brown, 55, was extricated from the car by fire personnel and transported to a local hospital by air ambulance. Charges against him are pending while the investigation continues. 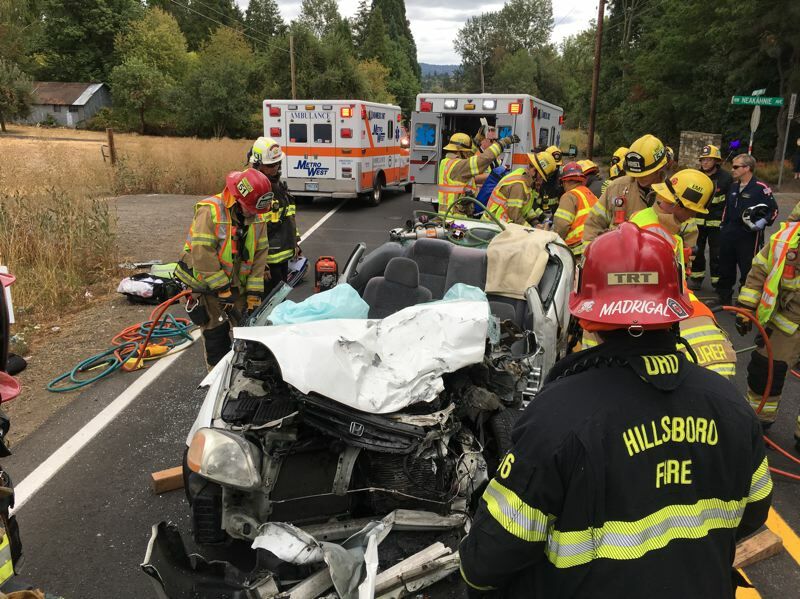 A passenger in the SUV, Julia White, 70, was taken to a local hospital by ambulance with serious injuries.The driver of the SUV, Roberta Knoll , 71, was taken to a local hospital as a precaution. According to the Washington County Sheriff's Office, at 11:35 a.m. on Sept. 1, deputies responded to an injury crash at Northwest West Union Road and Northwest Neakahnie Avenue. Witnesses reported that a white 1998 Honda Civic crossed the center line and crashed head on into a blue 2007 GMC Sierra. During the investigation, deputies learned the Honda was reported stolen earlier in the week. Inside the vehicle, deputies located a stolen rifle. The Washington County Crash Analysis Reconstruction Team responded to the scene to help with the investigation.